A day when Islamic Terrorists.. It was a special day…..
Much has been written and reported about the life and times of Coach Paul W. Bryant. I will not reproduce or copy anything that has been written previously about this great man. There is no need to..
His accomplishments and the lives he touched throughout his life speak for themselves. But I want to say he was larger than life and still is….. When you were around him, you knew you were in the presence of a Legend. I miss his single purpose…..
His steel determination and preparation…. But mostly, I just miss him…..
Our old friend Dave Snyder, Penn State class of ’71, witnessed one of the best stories I’ve ever heard about Coach Bryant. It occurred prior to the “Bama-PSU game in 1981 (won by ‘Bama, 31-16). 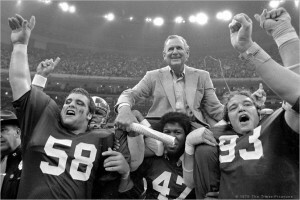 Coach Bryant was leaning against the goalpost intensely watching the Crimson Tide warm-up (his standard pre-game spot) when a small boy wearing a PSU jersey approached him. Dave said the entire stadium went silent, almost as if they were scared for the safety of the child who interrupted the coach. Everyone watched as he held up a pen and notepad, and Coach Bryant knelt down, spoke with the boy for a couple of minutes, autographed his paper, and shook his hand. As the boy happily ran off, the entire stadium came to its’ feet and applauded Bryant entussiastically for several minutes. With the exception of the “shortened” end zone in 1983, I always thought our series with PSU was one of the best in college football, and look forward to it resuming.